After time has been entered on the timesheet, it may be necessary to make changes or corrections to the submitted time. This procedure provides instructions for how to make adjustments to time using the timesheet. If time is entered incorrectly or was entered correctly but needs to be changed, follow these steps to assure the timesheet is properly adjusted. To see how timesheet adjustments change payable time, please refer to step 23 in user procedure 15628. All UW: Employees can access the MyUW System portal at https://my.wisconsin.edu/ using their UW Institutional ID username and password. On the MyUW System portal, the Timesheet can be accessed through the Timesheet link on the Time and Absence app. UW-Madison: Employees can access the MyUW Madison portal at https://my.wisc.edu/ using their UW-Madison NETID username and password. On the MyUW Madison portal, the Timesheet can be accessed through the Time and Absence app. Access the timesheet by clicking Manager Self Service > Time Management > Report Time > Timesheet. 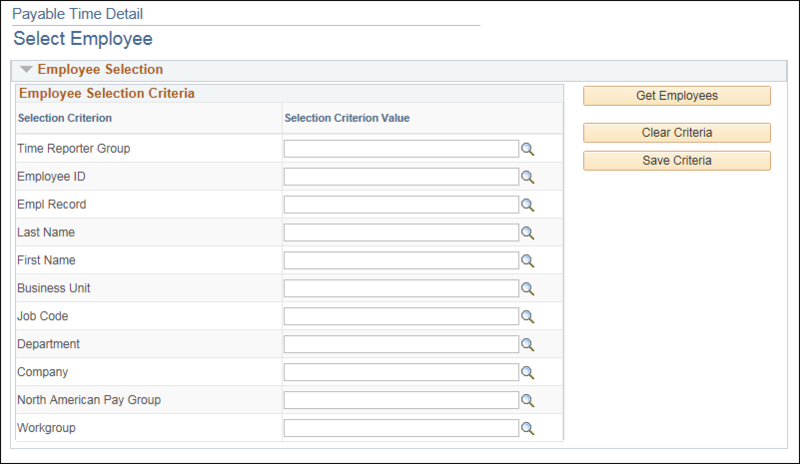 The timesheet search criteria page will appear. Choose the date of the time adjustment. Enter a specific employee ID (EmplID), or look up by Last Name and/or First Name. Click Get Employees. Best Practice: When selecting multiple employee timesheets to update, use the Group ID selection criteria only. Entering in multiple selection criteria may cause some employees to be inadvertently filtered out of the search results. The use of multiple selection criteria is best used when a Group ID contains over 100 employees. Click the employee name hyperlink to access the timesheet. You are taken to the timesheet. The timesheet page displays the two week period which includes the date for which the time adjustment will be made. In an elapsed timesheet, if time was not reported for a day, enter the total hours for the day in the corresponding field. In a punch timesheet, if time was not reported for a day, enter the In and Out times, as applicable. If the employee does not have auto lunch and took a meal break, enter meal times. In the example below, time is missing for Tuesday. Enter In/Out times as appropriate. Click Submit to save your changes. The submitted icon displays when the time has been successfully submitted. In the elapsed timesheet, if the day's time needs to be deleted and the employee does not have a default schedule assignment, delete the row with reported time be removed and click Submit. In the elapsed timesheet, if the employee has a default schedule assigned enter 0.00 in the quantity field to override the scheduled hours and click Submit. In the punch timesheet, if the day's time needs to be deleted, click the minus (-) sign on that day's row. In the punch timesheet, if the day was a scheduled work day but the employee reported an absence, use the Time/Absence drop down to select the appropriate absence take. Upon selection of the absence take, the punch fields and any data entered in them disappear. If the employee has a schedule, the quantity field will populate with the number of scheduled hours automatically. If the employee does not have a schedule assigned, enter the quantity of hours associated with the absence in the quantity column. If the absence has been submitted by the employee via self service or by someone not present on the employee's TL Security page, the "Needs Approval" status icon will display. If the absence was submitted by a supervisor or payroll coordinator present on the employee's TL Security page the absence is automatically approved upon submission and the "Approved" status icon appears. To change time in an elapsed timesheet, replace the current quantity with the corrected quantity. To change time on a punch timesheet, delete the the entire row where punch time(s) need to be modified. Submit the timesheet. Reenter the punch times appropriately. Submit the timesheet again. If the day's time on the punch timesheet was reported with a Time Reporting Code and Quantity, change either as needed. Enter the number of hours on the new row for the day in the quantity field and select the applicable Time Reporting Code from the Time/Absence drop-down. In the punch timesheet, if the assigned schedule includes lunch In/Out punches, modify the day's first Out or second In field to adjust the lunch Out or In time. 3. Update the timesheet with all punches, including the updated meal punches. 1. If the assigned schedule includes an auto lunch and does not include lunch In/Out punches, modify the day's lunch time by selecting a different lunch time in the timesheet Lunch Deduct field. 2. Lunch Deduct is part of the Additional Elements within the timesheet which are collapsed by default. To expand Additional Elements, click the 'Additional Elements' tab above the punch timesheet fields. 3. Once expanded, select the appropriate Lunch Deduct option from the drop down list. NOTE: If you wish for the Timesheet to default to the expand view each time you access it without having to click the Additional Elements tab, check the "Show all columns by default" box prior to submitting your changes. (If you do not want the timesheet to default to the expanded view, you may leave the box unchecked. Any data entered into the Additional Elements fields will still apply whether the timesheet is collapsed or expanded). 1. In the punch timesheet, to choose Compensatory Time in lieu of paid Overtime put a check mark in one of the checkboxes in the "Comp Time" column on the right side of the timesheet. To assure that any overtime is calculated as comp time by the Time Administration job, it is important to put the check mark on a day within the week that actually contains reported time. Only one of the Comp Time checkboxes needs to be marked within the week you wish for Comp Time to generate in lieu of overtime. You do not have to check the box on each day showing reported time. **Note: If you wish to designate comp time earnings in lieu of holiday premium, the Comp Time box on the row of the holiday worked hours must be checked. In the punch timesheet, to choose Compensatory Time in lieu of Holiday Premium check the Comp Time box on the row associated with the holiday worked hours. To assure that Holiday Premium is calculated as comp time by the Time Administration job, it is important to to put a checkmark on EACH HOLIDAY within the period. If the period contains more than one holiday, each holiday will need to have the comp time checkbox marked. In the elapsed timesheet, the employee designates Comp time with a Time Reporting Code, ECT10 (Exempt Comp Time Earned 1.0) or ECT15 (Exempt Comp Time Earned 1.5). Enter the number of overtime hours worked for the appropriate day and select the appropriate TRC. To make time adjustments for a previous time period, on the Timesheet Summary page select the date or period for the adjustment. Use the guidelines listed above to make the timesheet changes. NOTE: If time adjustments are made to a prior period, be sure to review exceptions and approve time for the prior period along with processing time for the current period. If time has been approved and then the employee's time is changed, the adjusted time will create adjustments in payable time which must be approved. Sometimes these adjusted payable time will be negative, it is very important that all payable time be approved. In the examples below, two hours per day are approved. Then time on one day is changed to four hours, and time on another day is changed to one hour. After Time Admin runs, the changed times appear in payable time detail for the amounts of the change and need to be approved. Changes made in timesheet: time for one day changed to four hours, and time on another day is changed to one hour. Payable time requiring approval after changes made in the timesheet and after the Time Admin job runs. On the Payable Time Detail Page, enter the Empl ID and click Get Employees. If payline entries were done, or adjustments were made directly in payroll (off-cycle, check corrections, etc) then a Record Adjustment entry will be reflected on the payable time details page. This is an indicator that a correction has already been completed and that a correction should not be made directly on the timesheet.